Green Snaps -- Slaps Pap's Camera! 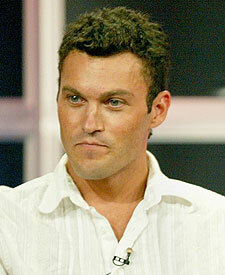 Move over Shannen Doherty -- Brian Austin Green is the newest "90210" alum to go crazy on an eager group of paparazzi! Green was hounded by shutterbugs while leaving the mall with his fiancée, actress Megan Fox -- and flipped out when a photog tried to sneak a picture of the "Transformers" beauty. Green confronted a pap head on -- before slapping the camera out of his hands! After the altercation, Brian approached another photographer and declared, "It's my Sunday!"